Biography and Paintings of Impressionist Landscape Painter. Misty Morning (1874) Musee d'Orsay. in the form of poster art. Top 10 Most Expensive Paintings. Sisley was admitted to the Official Salon Exhibitions of 1866, 1868 and 1870. His paintings showed a keen interest in the colour of trees and buildings, and for the changing effects of light and clouds above a landscape. His style was sober, quiet and consistent. In 1870 he lightened his palette and began to use broken touches and strokes of juxtaposed colours. Barges on the St Martin Canal (1870, Oakar Reinhart Foundation, Winterthur) is an example, showing how he depicted reflections on the surface of water by rapid strokes in the style begun by Monet and Renoir at La Grenouillere. Other early landscapes by Sisley include: Lane near a Small Town (1864, Kunsthalle, Bremen); Village Street in Marlotte (1866, Albright-Knox Art Gallery, Buffalo); Women Going to the Woods (1866, Bridgestone Museum, Tokyo) and View of Montmartre from the Cite des Fleurs (1869, Musee des Beaux-Arts, Grenoble). These early views are sombre in tone, but displayed a detailed construction and a taste for broad areas of sky and ample spaces. In his still life painting, Heron with Wings Spread (1867, Musee d'Orsay), his subtle harmonies of tone are apparent. A crisis arose in 1870, when the family business crashed because of the Franco-Prussian War. 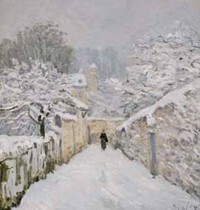 Sisley was immediately thrown onto his own resources, and forced to live off the proceeds of his art, a task for which he was wholly unprepared. To reduce costs he moved to Louveciennes near Paris. Unlike other Impressionists, who could turn to portrait art to earn money, Sisley only painted landscapes. In addition, he worked to a fairly standard format characterized by the receding perspective of a road or lane - see, for instance, Rue de la Machine, Louveciennes (1873, Musee d'Orsay) or Louveciennes, the Sevres Road (1873, Musee d'Orsay) - and recording the effect of the changing seasons in the same place, as in Louveciennes in Autumn (1873, Private Collection) and Louveciennes in Winter (1874, Private Collection). After 1880 Sisley went to live near Moret-sur-Loing, then in Moret itself, becoming more and more isolated. Under Monet's influence he modified his technique, broadening his brushstroke and working his surfaces more heavily. (See also Impressionist Painting Developments.) In a different spirit from Monet but using a similar technique, he began a series of pictures on the surrounding countryside, at first near St Mammes - as in The White Cross of Saint-Mammes (1884, Museum of Fine Arts, Boston), Saint-Mammes (1885, Musee d'Orsay). After this he painted mainly views of Moret, such as: The Bridge at Moret-Storm (1887, Le Havre Museum), Haystacks at Moret - Morning (1891, National Gallery, Melbourne), The Church at Moret, after Rain (1894, Detroit Institute of Arts). 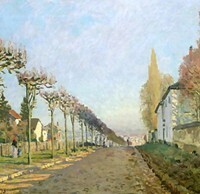 A one-man exhibition at Durand-Ruel's gallery in 1883 and another at Georges Petit's in 1897 did not bring Sisley much success, and he continued to live in very straightened circumstances. Other examples of his late Impressionism include: The Church at Moret (1894, Musee du Petit Palais, Paris) and Langland Bay, Storr's Rock - Morning (1897, Kunstmuseum, Bern). Sisley stopped painting in 1897, due to the onset of cancer, and died two years later in Paris at the age of 59, just a few short months after the death of his wife. He died in poverty: it was only after his death that his reputation as an artist began to grow. Like the English landscape artist John Constable, Sisley only liked to paint places he knew well, and he particularly liked the Seine and Thames valley areas. 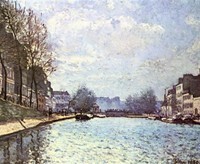 His works - like those of Monet and Camille Pissarro (1830-1903) - are what art historians would call 'pure' Impressionism. Even so, because his work never evolved outside of this area, his paintings have been largely neglected, and while he is relatively famous, very few of his works are known. 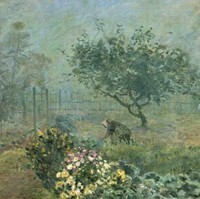 It is suggested that he became a victim of style, a slave to Impressionism, rather than using it as a base to progress. Whatever the case, it is true that his evolvement as an artist was not as dramatic as other modern artists of his group, like Monet or Degas, both of whom lived into the 20th century. Because Sisleys subject matter was largely limited to landscapes, in which only a few characters may appear as decoration, many viewed his style of painting as boring and lacking a personal touch. However, much the same can be said of Monet. His relatively early death put an end to the sign of renewal in his painting that was appearing in the 1890s. Overall, his paintings have been overshadowed by more famous painters of the time - in particular by Monet whose work he most resembles - although Sisley tended to be less experimental and worked on a smaller scale. Sisley is one of the great figures of the Impressionist movement. A fervent disciple of outdoor painting and clear tone values, like Corot and Pissarro he loved the countryside of the Ile-de-France. His work, however, differs from theirs in its concern for composition and an almost monumental balance, contrasting with a quiet familiarity of his chosen sites. He is now ranked as one of the great Impressionist painters and one of the great landscape artists in the history of art. His works can be seen in many of the best art museums around the world, notably the Musee d'Orsay, Paris.  For more biographies of modern French artists, see: Famous Painters.  For more about Impressionist landscape painting, see: Homepage.